Unlike other islands in France who are connected to the continent with bridges or roads, the only way to come to Groix is to take the boat. Great news, because the discovery and fun start even before setting foot on the island ! Let’s see how to get there. The ferry boats leave from the city of Lorient. The ferry terminal is easily accessible by car, by the RN 165 road. Upon the arrival in Lorient, watch for the « Lorient / Embarcadère Ile de Groix » sign. Lorient is a 2 hour drive from Rennes and Nantes, a 5 to 6 hour drive from Paris. 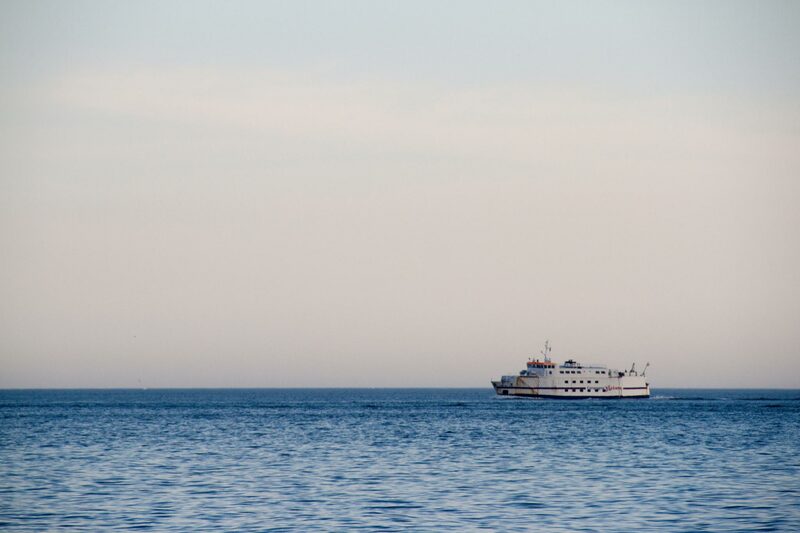 If you travel by train, the bus line number 2 (from Monday to Saturday) and number 3 on Sundays will take you to the ferry terminal. The bus stop is on Cour de Chazelles, by the bus station called « l’Orientis ». You can also walk from the train station to the ferry terminal if your luggage isn’t too heavy (approximately 20 minutes). Please note there is another ferry company, Escal’Ouest (smaller boats for passenger transportation only) with departures from la Base, cité internationale de la voile Eric Tabarly, in July and August. For more information (in French) visit their website. How much does it cost to go to Groix ? The adult passenger fare is 30€ round trip in low season, 35€ in high season or rush days (some weekends throughout the year), 20€ round trip for children from 4 to 18 years old. The crossing is free for children under 4. You’ll find more information on the vehicle fares, including bikes and motorbikes on the ferry company website. The price depends on the size of the car, but the fare starts at 150€ round trip. Should I take my car on the boat ? The question really is, do you need it to go around on the island ? If you stay from one day to a week (or even more), our answer would be no. The island is rather small, you can go around walking or with bikes (you can rent some, electrical or not, at the harbor and in the main village). If needed you can also rent a small car in Groix. There is a bus service as well. Where to park my car ? There is a parking lot outside the ferry terminal, but beware, during high season it is very often packed. Right by it is a private parking with subsequent day rates. It’s easy but not economical ! Here’s our tip : by the train station in downtown Lorient, there is an underground parking lot in the l’Orientis building. For less than 20€ a week, you can park your car and take the bus to and from the ferry terminal (line 2 and 3). It’s the best quality/price ratio, just bear in mind that you have to get there well ahead of the ferry’s departure time, just to make time for pre-payment and for the drive in bus. 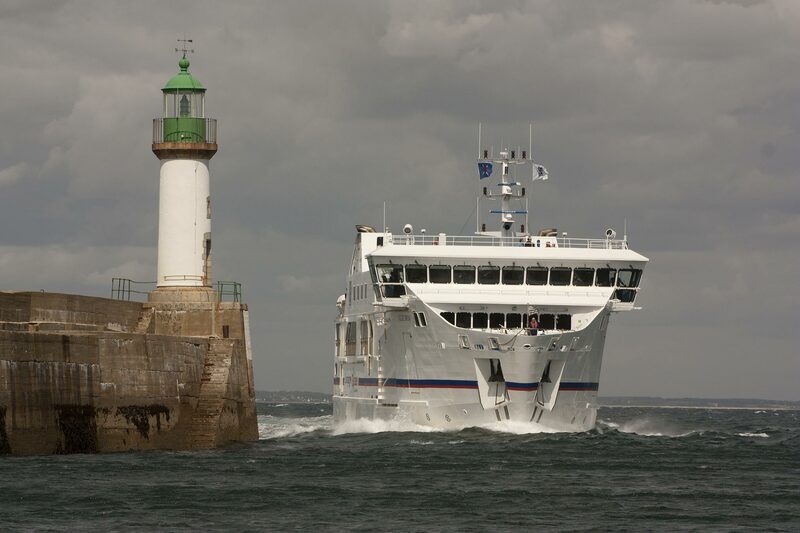 The two boats, « Ile de Groix » and « Saint-Tudy » can transport up to 450 passengers and respectively 32 and 20 vehicles. The boats are comfortable and offer indoor and outdoor seating. You will find toilets and vending machines inside. The crossing takes approximately 50 minutes, almost half of which will take you through the commercial harbor of Lorient and by the various seaside little cities along the coast. On port side (on the left), before getting in the open sea, don’t miss the Port-Louis 16th century fortification. Once the boat sails past, you can get a view of Groix and maybe already spot a few landmarks : the Grands Sables beach or the Pen Men lighthouse. Open your eyes, breathe deeply this crisp sea air, just sit back and relax, in a few minutes you’ll get to the Port Tudy harbor !